Yayyyyyy!!! Thanks, Mom and Dad, and SORRY! to my big sister, Ann, and my younger sister, Tanya! Have to share it. It's the.best.vintage.photo.ever. I am guessing it was taken somewhere around 1978. We are standing in my elementary school gym, possibly at a craft show or something. I was in Brownies then, so it might of had to do with that. Oh my goodness, it makes me grin so big to see this photo again! Sean's favorite song to sing right now is "Happy Birthday to You." He loves to serenade each of with this happy tune. If it actually happens to be someone's birthday that he knows, we will call them up and leave a singing telegram via voice mail. The other day, he stepped it up a notch and played guitar while singing. He's Daddy's little rock star! 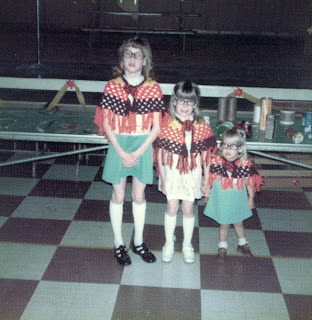 Growing up as the middle daughter of three girls, I have many memories of my sisters and I dressed in matching, handmade items crafted by my mother's hands. One piece in particular stands out as a favorite: the crocheted ponchos she made us, in shades of brown and orange. A child of the 70's, a girly girl, and the perfect garment for skipping, dancing and twirling. I might have to sift thru boxes of photos to see if there are any of us in the ponchos. When I started knitting, one of the first patterns I looked for was a poncho for Eleanor Ruby. I found the Knitting Pure and Simple Children's Poncho over a year ago, but wasn't sure if my skill was ready yet. Then I found a beautiful yarn that I had to have to make into something lasting for Eleanor to enjoy. Two skeins of Mosaic Moon Mountain Meadow Worsted yarn in the Selah colorway arrived with it's coordinating aqua trim back in October. I had to sit it aside for months while I worked on Christmas and birthday gifts. I decided that my first garment of the new year would be Ella Roo's poncho. I was pleasantly surprised by what an easy garment it was to knit! I made the 2-4 year old size and didn't make any major changes to the pattern. Only thing I think I did was purl the first row of the hood so I had an easy marker for measuring the length of the hood as well as adding a design element to the neckline. I also picked up four extra stitches on the hood because I thought it spaced the stitches out better than the recommended amount. I worked on it a few hours a day for 11 days until I had it completely finished. It's beautiful, a perfect fit, soft, warm, and just what I hoped for. It warmed up to 22 degrees today, so Ella and I took a short walk in the sun with her favorite baby and her sparkly new shopping cart from Nana. I hope this is the first of many fun memories for her and her poncho. Sit back and enjoy this wonderful collection of photos and video clips of our beautiful kiddos with Down syndrome! The Pay it Forward: Rock the ONEder campaign continues to grow. Kelle Hampton's words from the heart and narration in today's video compilation is breath taking. Catch Sean shaking his moneymaker at the 5:39 mark! We finally got our first snowfall of the winter! It started coming down Sunday evening and snowed all night and thru the day Monday. I think we ended up with about 4" of soft, fluffy, pretty powder. Not bad enough to cancel school, so both boys went to school while I stayed tucked home with Ella. I bundled Eleanor up to go out once and she lasted just a little while before she said it was too cold. She outgrew her cute pink snow boots from last year, so she wore a pair of Sean's hand-me-downs. Hee hee! They were a bit big, but she did alright in them. After school and a snack, the boys got geared up and we all went out again. It's too bad we don't have a hill to sled on or pretty woods to take a quiet walk through. They just stomped around in it a bit, made some snow angels and tried to make snowballs. It wasn't wet enough to make snow balls though, so they just chased me and threw handfuls of snow at me. Silly boys! We came back in and changed out of wet clothes, then Sean helped me get supper in the oven. My Grandma Eleanor's Mountain Lady Meatloaf is just what our cold day needed! I made a side of Mac & Cheese and some early peas to go with it. My sister, Ann, asked me awhile ago to write down the recipe for her, so I thought I'd just share it here. Enjoy and stay warm! Mix all ingredients together in a large bowl, make sure to really work in the sausage as it likes to cling together. If it seems to dry, add a bit of catsup, if it seems too wet, add more crackers. Dump into bread loaf pan and shape into a loaf. Bake for 1 1/2 hours at 325 degrees. Remove and let rest 5 mins, then very gingerly pour off any fat into your empty soup can so the fat can be thrown away. Turn meatloaf onto a platter and slice. Makes about 5-6 nice big slices. *My Grandmother noted on her recipe, "The left over meatloaf is good cold, for sandwiches. The meatloaf should have a crisp brown crust. This is a favorite recipe of my son, Dale." Friday afternoon, I was just skimming Facebook and caught a request from Kelle Hampton: "Short notice, but if any D.S. mamas are willing to share photos that they wouldn't mind being shared on the blog, please e-mail the best photo of your beautiful child in the next twenty minutes to kellehamptonblog@comcast.net, and please include the name of your child (I'll only first names) and a short written statement that you give me permission to post. Epic fundraiser starts tonight in honor of Nella's b-day!" Epic doesn't even come close to describing the magic that is happening on Enjoying the Small Things since Friday night! I had no idea that emailing a photo of Sean would include him in the most amazing out-pouring of love and acceptance that I've ever seen! It gives me chills. So if you haven't had a chance to read her post, Pay It Forward: Rock the ONEder yet, please do. And if it inspires you as much as it has inspired so many, make a donation in honor of Sean, beautiful Nella on her first birthday, and the other 400,000 people living with Down syndrome in the United States. Kelle's amazing photography, love for life, dedication to her family, motivation and pure joy inspire me every time I click onto her blog. Thanks, Kelle, for taking center stage and singing loud! Generally, Ella takes her afternoon or mid-morning nap on the family room couch. It's much easier for me to get her to sleep and lay her there than to try to carry her 28 lbs up old creaky wood stairs to her bedroom and hope she doesn't wake up. Works for me. However, my mom gave us a down-alternative comforter for our king size bed for Christmas. When all three kids were home ill, we opened it up and made a little nap mat on the cushy carpeted floor. They napped on it, snuggled on it, watched tv, etc. while resting up. It makes such a cozy little nap mat, I'm not in a hurry to put it to it's rightful use. Approaching 10 years of Will! Matilda's Journal -Ok, mum's too! We are all registered for the 2013 20th Rundisney races!! Too funny- The Doobie Diaper! All original content of this blog, both words and images, is held in copyright by Deborah Minner. Use of any kind, in any medium, for any reason without express, prior written consent is prohibited.